Function and Safety Are #1! While working with a young couple, a serious issue arose about code compliance. Access increases to a minimum of 48” if multiple people are working in the kitchen simultaneously. These guidelines allow safe usage of appliances, and unlimited access to everything stored in cabinets. The homeowners requested a four-foot wide by eight-foot long island. Their kitchen is narrow – only 13′-11” wide, with no room for an addition. Fortunately, the length of the kitchen is generous. I sent an email with these unfortunate results of my calculations. They were not happy, and repeated the desire for a four-foot wide island. I shared information about the appliances which would be on both sides of the kitchen. Each appliance needs space for accessibility, which I took into consideration as I worked out the numbers above. This is actually one of the many aspects where my years of education and design experience comes in handy. In an NKBA seminar, I learned from Ellen Cheever to show all appliance doors open in my plans. Homeowners can see how much clearance they have between objects. Oven and dishwasher doors can take 24” or more from an aisleway. Refrigerator doors vary from as little as 18” to over 36”, depending on the manufacturer and model. Although my clients wanted the larger island, we were able to proceed through the logical design steps. With careful planning, I was able to give the homeowners 42” aisleways on both sides of the island. I reduced one partial wall of cabinetry to 12” deep for a wine bar and pantry. The double ovens were placed adjacent to the end of the island. Someone can now access the oven door head-on, which is normal and safe. It is especially important to provide this head-on access so that a homeowner can cook and access something heavy, like a Thanksgiving turkey, or something awkward, like a casserole or a large sheet of cookies. I allowed an aisleway of 4′-10” along the cooktop wall, from the oven to the main sink on the opposite wall. This area could become seriously congested with multiple users. I use the guidelines developed by the NKBA as a standard practice in every kitchen (or bathroom) design. I learned them over 25 years ago when preparing for my certification tests. And I still use them because they verify industry standards for safety and function. I have discussed this in articles I’ve written in the past. 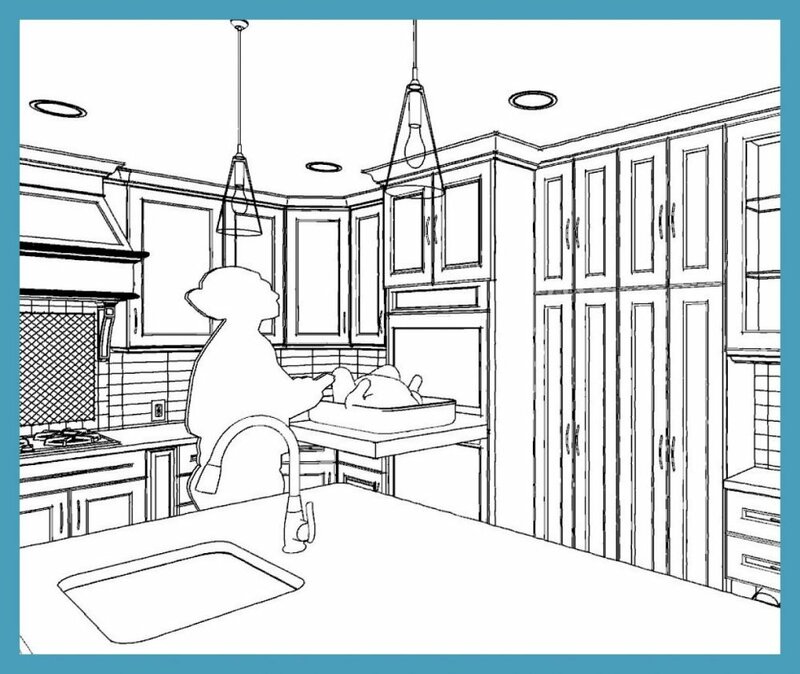 In “The Kitchen Triangle: A Guideline,” I state that Function and Safety have to be designed into a project from the get-go. Appearance should be determined after everything is deemed to be functional and safe. I later wrote another article, “Kitchen Islands May Not Be Appropriate For Every Home,” in which I share the guidelines for walkways and island design. Work Aisle – Recommended: The width of a work aisle should be at least 42” for one cook and at least 48” for multiple cooks. Measure between the counter frontage, tall cabinets, and/or appliances. Access Standard – Recommended: Kitchen Guideline recommendation meets Access Standard recommendation. See Code References for specific applications. Yes, I care — a lot! That’s why I am sharing this story to help you understand that professional designers have to balance creativity and code knowledge, while trying to give their clients what the clients want, often within a limited budget. It sure isn’t an easy career path, but I still love it! You’ve hired a professional designer to help you. Listen to them, and take their recommendations seriously, because they have your best interest as a goal. Remember that Function and Safety are the #1 priority in all remodeling, especially bathrooms and kitchens. Appearance can be any color or style after function and safety are verified. If you’re thinking about remodeling your kitchen (or bathroom), please call me! I care about your health, safety, and welfare, and I want to help you achieve your remodeling goals! Homeowners, who are grandparents, love to entertain their family and friends. They especially love to take care of their grandchildren. Although the kitchen had an upscale remodeling by previous owners, many things about the kitchen didn’t fit my clients’ needs. Main problem: It was very dark. We created a bright new kitchen for the grandparents! I was pleased to use virtual-reality renderings to help the couple make important decisions, to create an ideal space for family and friends. Lighting was insufficient, and the dark cherry cabinets and granite countertops soaked up most of the light. A pantry closet dictated the placement of appliances and limited available countertop space for food preparation. The only place for the cooktop was in the island; it was a downdraft with a pot rack above, which created an ongoing cleaning problem from grease that escaped the surface-mount downdraft. There was no place in the kitchen for sorting mail or charging phones and pads. There were very few storage accessories inside the existing cabinets. Dimmable LED strip lighting was added below and above the wall cabinets to provide great task and indirect light. Dimmable LED recessed fixtures were placed in a 4′ grid, providing aisleway lighting. The same fixtures were installed above the new island. Turning the closet pantry 900 gave more space for the ovens and cooktop, and freed up the island countertop for food preparation. Cabinets around the perimeter were natural alder; the island was stained darker for visual interest. Stain the crown molding at the top of the cabinets and the light baffle below the wall cabinets to be stained the same color as the island to tie everything together. I showed them two alternatives in virtual-reality renderings. The homeowners chose not to follow my advice, even after I showed them the difference. Install a prep. sink in the island. During the value engineering by the contractor, we discovered that this feature was more than the homeowners wanted to pay, but they were able to make an informed decision without any regrets. I give advice to show clients the possibilities and to make informed decisions. I listen to their needs and work with them to achieve what they want within a reasonable budget. I honor all of my clients’ decisions. It’s their home, and their budget. The kitchen was transformed and we created a bright new kitchen for the grandparents! If you know what you want in and for your new kitchen, but don’t know how to pull it together, I can help you select the right products and offer alternatives, so you won’t have any regrets down the road about your decisions. Call me today, so we can talk about your kitchen! Custom island, with wine rack and bookshelf on back side; rollouts and drawers on front side. My clients were a couple who bought a new home in the location they wanted. They knew the whole house needed remodeling. Their blended family includes six adult children. They wanted to achieve a large addition for a dining room and to enlarge the kitchen, and possibly enlarge the master suite above the kitchen. Very shortly after they bought the home, they called me to help them design their whole-house remodeling project with major additions. ◊ A positive report from a soils engineer that the proposed addition was okay. It’s human to just go ahead and assume that everything will be okay — that’s a normal expectation. Unfortunately, the 760 square-foot proposed addition had too many complications on multiple levels. The addition wasn’t feasible. The homeowners had two choices: To resell the home and find another home, or stay in this home and make the best of it. The Whole-House Remodeling Project Forged Ahead! They took several weeks to talk about their alternatives and make a decision. I received an email telling me that they wanted to proceed, but scale back their whole-house remodeling project severely. The first part of the meeting after getting that message was uncomfortable for all of us, like trying to speak and understand a foreign language to build a strong bridge of communication. I felt the anguish they had experienced, and listened to their story to gather information about our direction moving forward. By the end of the meeting, we had achieved a new level of understanding and compassion. I went back to work to see how we could achieve what they wanted, using the original wish list we had compiled. The smart home and the workshop with a storage mezzanine above wasn’t a problem, but the rest of the list was a challenge. DINING ROOM: There was no way that the existing dining room would comfortably seat 16-18 people, because it was landlocked. When I asked the homeowners if they would ever seat that many friends at the dining table, they responded that the only reason for needing a large dining room was for family gatherings. I widened the doorway between the adjacent entry hall. If two tables were placed next to each other and extended to the maximum possible into the entry hall, it would seat 18 people. A custom cantilevered cabinet is a beautiful display hutch with a granite countertop. LARGER KITCHEN: The kitchen was expanded to be in the same plane as the garage, approximately five feet. We achieved this by cantilevering the floor joists and creatively framing a new roof over the kitchen, so the ceiling could be extended at the same height. This additional space gave the homeowners what they wanted. They chose custom gray cabinets, granite countertops, and porcelain tile with glass tile accents. A bonus in the kitchen is the heated countertop where they can sit for casual meals. 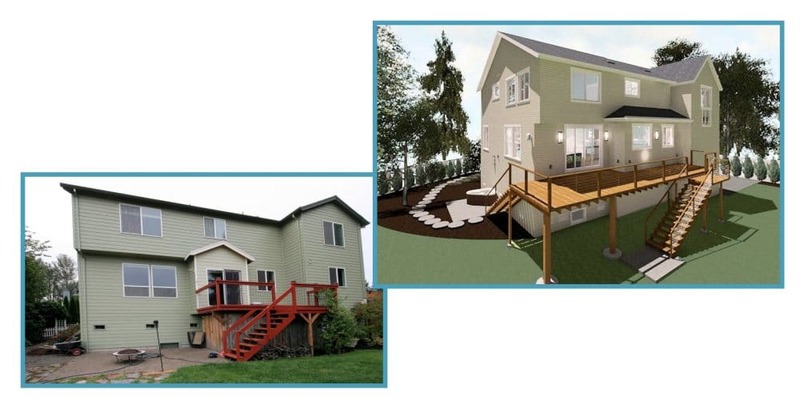 LARGER DECK: The planning department didn’t balk when we submitted the plans that included a new deck that was three times larger than the original deck, because a structural engineer designed it for stability on unstable soil. The new deck has two sets of stairs: The large main stairway leads to the rear garden, and a side stairway leads to a concrete pad for the family hot tub. LIVING ROOM: The homeowners found a manufacturer of stacking patio doors that met their requirements. They selected a new fireplace, and we designed the surround, mantel, and recessed AV controls that would be hidden by the flat-screen TV mounted on a heavy-duty swing-arm support. WIFE’S OFFICE: The original den, adjacent to the entry hall, became the wife’s office. She requested a larger side window so she could see the floodplain and the wildlife. MASTER BATHROOM: New cabinets, countertops, plumbing and lighting was designed to replace the existing double lavatories. A two-person shower replaced the existing 6-foot whirlpool tub. We replaced the double doors with a single 3-foot wide door that allowed the master shower to be amply deep. The existing window remained, and a new window was installed adjacent to the wife’s new generous makeup area. WASTED SPACE CONVERTED TO A GUEST BEDROOM AND BATHROOM: This home had a large open area on the second floor, about 170 square feet, that was useless wasted space. The laundry room was adjacent to this room. I designed a wall along the upstairs hallway to enclose the room, and converted the laundry room to a bathroom with a neo-angle shower. LAUNDRY ROOM: Borrowing about 10 feet from the large room allowed enough space for a laundry room that was accessible from the hallway. It has storage cabinets, a large single sink, a built-in ironing center, and pull-down rods for air drying clothes. PLAY ROOM: The perfect location for this was a large corner bedroom separated from other bedrooms. A state-of-the-art ceiling projector and built-in speakers are the heart of the environment. We added a platform for two levels of comfy theater seats to watch TV, movies, and play video games on the humongous screen. MORE STORAGE: One storage area is a cabinet that’s cantilevered into the garage, for bulk purchases. It’s high enough so no one will bump their head. Another storage area was achieved by redesigning the upstairs hallway to allow the addition of two deep closets. The loft above the husband’s garage workshop will also provide a lot of storage for seasonal accessories, luggage, and more. We worked on this whole-house remodeling project for 15 months. The plans I prepared totaled 26 pages on 24” x 36” paper. The plans included 40 interior elevations, four exterior elevations, and eight virtual-reality perspectives. The general contractor called me the day he went to the building department. He said with excitement, “The plans were approved with no comments and no red marks!” He told me this is the first time in over 40 years that plans were approved so quickly without requiring additional information or revisions. I was happy to hear this, but this has happened with my plans many times. Details are important! It was a joy to attend the housewarming party, to see the homeowners enjoying their new home and witness the guests’ reaction to the transformation. One of the guests was the agent who helped the couple find this home. He told us he couldn’t believe that it was the same home. It was a major transformation that the couple will love and enjoy for years. This is what makes me happy, when I know we’ve achieved my clients’ goals. If you have an existing or new home that you’d like to transform, I can help you! I listen, and give honest feedback. I prepare detailed plans to help everyone involved in your project help you achieve your goals. Call me today to chat about your home remodeling desires! The couple knew it was time to remodel when their appliances died, starting with the refrigerator. The wife fell in love with a black stainless french-door refrigerator made by Samsung. The has a plethora of baking and cooking vessels, as well as numerous small appliances. Meetings at their home have been mouth-watering, hunger-making experiences. There was always something being cooked or baked, and I’ve often left our meeting with a full container of irresistible nibbles. When the couple was looking for a new refrigerator, two years before they called me, the wife fell in love with black stainless steel, and decided that all of her new appliances would be that finish. These appliances look striking and the manufacturer, Samsung, has figured out how to make the finish impervious to fingerprints. #1: The existing builder-grade oak cabinets had useless base corners, and the wall cabinets were dropped down from the ceiling 12”. Both features wasted potential storage. ◊ Dividers for serving trays, cookie sheets, muffin tins, etc. #2: The existing countertop was “Pepto-Bismal” pink laminate. The homeowners chose an off-white quartzite countertop that will allow the kitchen sink to be mounted below the countertop. Quartzite is natural stone that’s harder and more impervious to stains than granite. It’s also more expensive than other natural or man-made stones. #3: A 42” table with four chairs was always in the way, especially if the wife needed to access small appliances she stored on a bookshelf adjacent to the back of the peninsula. A built in “table” made of the countertop material was attached to the back of the peninsula, allowing the peninsula to be moved toward existing windows approximately 12” – this gave more area for storage, and more countertops for preparation and cleanup. 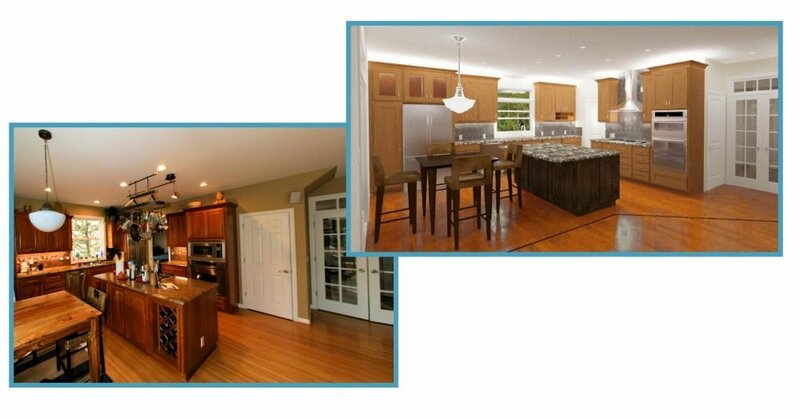 #4: Kitchen lighting was one surface-mounted fluorescent strip which led to shadows where the family needed to work on the countertops. The new kitchen was improved with dimmable LED self-adhesive strip lighting to light the countertops and provide indirect lighting. There are three dimmable LED pendant fixtures over the peninsula, and six dimmable LED recessed fixtures, in addition to a new dimmable LED chandelier in the eating area. Success for a Deserving Couple! The couple made sacrifices to educate their children. They provided the best meals possible in a dysfunctional, outdated kitchen. It was finally time to do something for themselves, so they can prepare five-star meals for their family and friends without hassles. It’s a unique remodeled kitchen for empty-nester foodies! *DESIGN TIP: Many wood species, especially exotic imported ones, are grown in controlled forests so they don’t deplete the trees growing in rain forests. If you are interested in using an exotic wood for cabinets and furniture, please verify that it has the authentic Forest Service Certified (FSC) designation, and verification of where the trees are grown. If you’re finally ready to remodel your kitchen and want to maximize every inch of space, call me today to talk about your project and hear how I can help you! My client, a retired California contractor, bought this 1970s rental home at the base of Mt. Hood because he loves outdoor activities with his two dogs. His #1 priority was to make the home brighter and more cheerful, while updating everything. What follows is a description of the challenges we encountered and the solutions that make this home unique. CHALLENGE #1, LIVING ROOM: A long, slender room, aka “the bowling alley,” that was dark even on bright days. SOLUTION: Add two “trayed” ceiling coffers so dimmable indirect LED lighting could break up the “bowling alley” look. It provided the right amount of ambiance for reading, watching TV, or enjoying the warmth of the wood-burning stove. Carefully-placed dimmable LED recessed lighting makes use of this room more flexible. A custom bookshelf and storage cabinet was designed to replace a bargain-furniture purchase when the gentleman bought the home. *DESIGN ADVICE: A solution used to change apparent proportion of odd-sized rectangular rooms is to paint the end walls a darker, warmer color because these colors appear to advance. The contrast doesn’t have to be drastic – one or two shades will make a big difference. It has been popular off and on to choose one wall to be an artificial focal point by painting it a wildly-contrasting color. Be very careful if you’re thinking about doing this in your home, unless you’re prepared to paint your walls frequently. Fortunately, this trend never stays around very long. 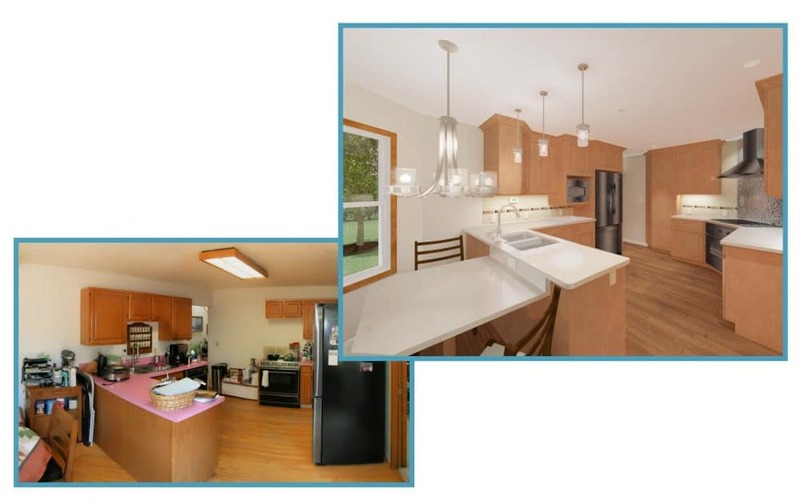 CHALLENGE #2, KITCHEN: The existing kitchen had red laminate countertops, inexpensive appliances, and dark oak “builder” cabinets. The window over the sink faced the side of a neighbor’s home — ugly! SOLUTIONS: The sink was moved to the new peninsula, which provided a great view of the front garden, and allowed a large countertop for food preparation. The homeowner fell in love with natural birch, a combination of heartwood and sapwood. He selected a Cambria engineered-stone countertop. The backsplash and floors are the same tile, with an accent of natural river rock behind the range. For architectural continuity, the same river rock was used for the entry hall flooring. CHALLENGE #3, BATHROOMS: Both bathrooms showed years of wear and tear by renters, and desperately needed updating. The guest bathroom was cobbled together by a previous owner, who framed an area for a small one-piece shower using fake paneleing attached directly to the studs, with no drywall. It was no surprise that the project manager ran into a massive amount of dry rot in the guest bathroom. SOLUTIONS, MASTER BATHROOM: The homeowner selected blue for the master bathroom. His eyes lit up when I showed him a sample of Vetrazzo “Float Blue” glass countertop and a unique blue glass mosaic tile for the backsplash and shower accent. He selected a large rectangular porcelain tile with a soft mixed gray stripe for the shower walls and the floor; the same tile in a 2×2 mosaic was used for the shower floor. A pale blue was used for the walls, and all bathroom fittings are polished chrome. The custom cabinets are natural birch, with two pull-out pantries for personal-care products. SOLUTIONS, GUEST BATHROOM: The homeowner wanted bright yellow and orange for the color scheme. I suggested a creamy pale yellow for the engineered-stone countertop and the tile used in the shower and on the floors. Bright yellow tile was chosen for the backsplash field tile, with a 1/2” stripe of bright orange tile at the top and bottom of the accent stripe. Custom natural birch cabinets blend with the color scheme beautifully, and polished-chrome plumbing fittings are like jewelry for this stunningly-beautiful bathroom. The homeowner got everything he asked for: a bright and cheerful new home with custom touches that exemplify his unique personality and taste. There’s no way to tell that this was ever a rental property! Do you have a hard time visualizing what remodeling results are best for you? Are you paralyzed with fear about selecting the right products for your home and lifestyle? I can help you! Contact me today!